The Cascadia Elementary School garden was established in 2017, with support from Common Threads and thanks to great support from the principal, Kellie Larrabee, and many excited parents. The Cascadia garden features raised garden beds with 150 square feet of growing space. The garden hosts a variety of plants such as strawberries, sunflowers and bunches of kale. Cascadia Elementary is exploring ways for gardening and cooking to contribute to the school culture. 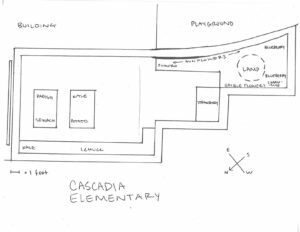 Cascadia Elementary is located at 6175 Church Road, Ferndale, WA 92848.